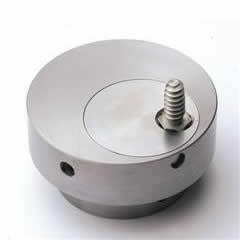 viz Screwchuck, Ball Drive / Socket or Faceplate. The Eccentric Chuck provides the means of driving from the headstock with or without tailstock support. However, the unique hexagonal balldrive/socket component allows multiple-turning between centres and at any angle between 0 and 20 degrees of the lathes axis.